The NiagaraAX Framework® is a software platform you can use to manage and control diverse systems and devices-regardless of manufacturer or protocol. Use it either locally or over the Internet with a standard web browser. For managing a smart building, Niagara provides all you need-visualization, integration, control and archiving of data. Niagara has worldwide appeal with 400,000 instances-including those from all major controls OEMs-for applications as diverse as airports, campuses, hospitals, schools and homes. Niagara Workbench™ is an indispensable solution for programming and maintaining a Niagara system however, it is seldom used with field controllers because the controllers do not incorporate Niagara. Contemporary Control's line of Sedona controllers – the BAScontrol series and the BASremote controller/gateway – can be programmed using Niagara Workbench 3.7 and 3.8 tools, meaning that the tool can be used with both Niagara and Sedona controllers, thereby greatly simplifying commissioning/programming. This makes the Niagara Workbenc™ a one-tool solution. The controllers utilize a direct 10/100Mbps Ethernet connection, utilize a web server for configuration, and are freely programmable Sedona standalone controllers. They can optionally be used as remote I/O with JACE supervision over BACnet/IP. The BASrouters are multi-network routers used to route messages between BACnet/IP, BACnet Ethernet and BACnet MS/TP networks. Three versions are available - two DIN-rail mounted units for fixed installations and a portable unit for commissioning and troubleshooting. Gateways map individual Modbus registers into BACnet objects. 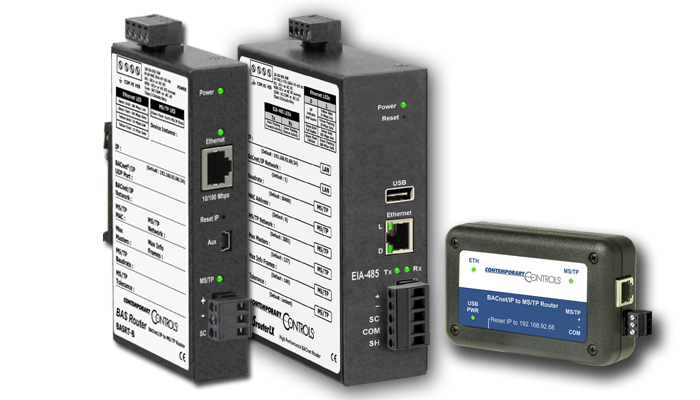 With the BASremote, all connected Modbus devices appear as one BACnet device object with a collection of object points representing the various Modbus registers. 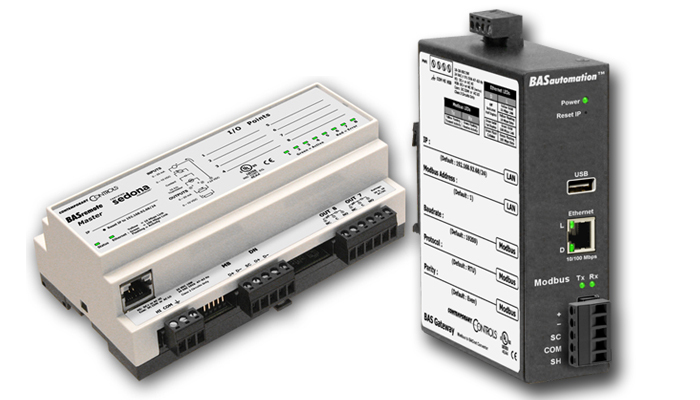 Using the concept of virtual routing, the BASgatewayLX treats each connected Modbus device as a separate BACnet device with object points representing only those registers of the addressed device.